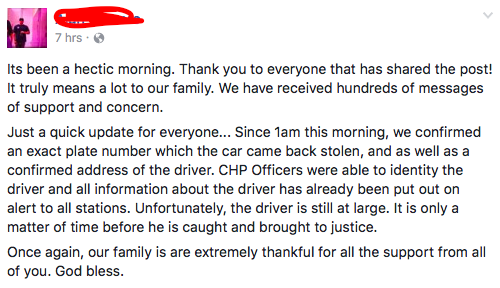 Update: as of Saturday, we have learned that the G37 in the video is confirmed to have been stolen. The driver is still at large. If you had a half-competent drivers' ed program, decent parents, or even a quality group of enthusiast friends, you know that street racing and aggressive driving is illegal, dangerous, and can turn your own or others' lives upside down if something goes wrong. Apparently, the driver of this Infiniti G37 in Southern California didn't get the memo, and decided they were going to go full Brian O'Conner on a highway between the cities of Colton and Fontana in Southern California. Things did not go well. During this race, the driver of said G37 swerved into an inside lane, dodging a silver Toyota, before cutting back across to try to shoot the gap between an unsighted black BMW and a semi truck. The Infiniti driver shoulder checked the BMW out of the way with their driver side door or fender, sending them sliding into the Nissan Altima they were racing. The BMW then ricocheted off the second racer and spun out of control, ending up beneath the semi. The incident was captured on a rear-facing camera, and uploaded to Instagram by user fenderdefender, who claims the BMW driver is the mother of a close friend. The video itself is mirrored. Unfortunately for the BMW driver, the misery didn't end with being pushed under a truck by an idiot. 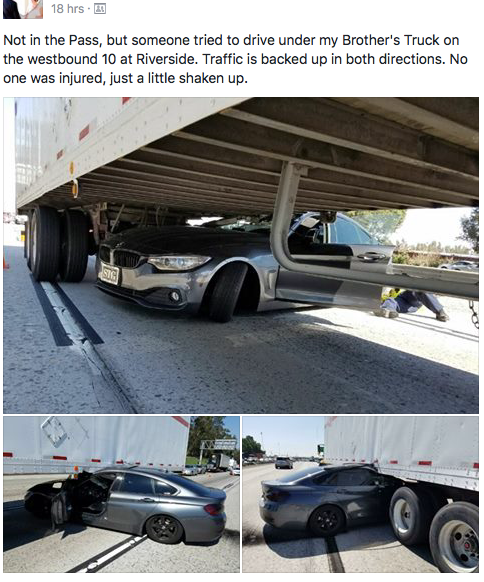 The truck's driver was unaware of the situation unfolding behind them, and assumed the BMW driver tried to drive under their truck, resulting in a Facebook post making fun of the driver. If the driver is caught, they will face a slew of fitting charges. Reckless driving, fleeing the scene of an accident, and street racing make up only the beginning of this driver's punishment. Their insurance company (if they have one) will give them a painful hike to monthly rates to pay for the totaled BMW and the damaged trailer. You know, assuming they still have their license when this is all over. The 13-month old was reportedly unrestrained in the back seat.